↑ "Timeline: The new Wembley". BBC News. 21 February 2006. 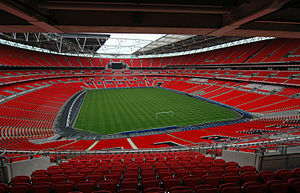 ↑ "Wembley to break even by 2015, says FA chairman". BBC News. 5 October 2011. ↑ "Projects: Wembley Stadium". Populous.com. ↑ "Timeline: A new National Stadium for the national game". ↑ 5.0 5.1 5.2 "Wembley Stadium, London". Design Build Network. 19 June 2006. Retrieved 11 August 2010. ↑ "Building Wembley: Construction facts". Wembley National Stadium Limited.